At this stage of building your business, you should have your business name and actual business formation completed along with your domain name(s) purchased. You should be ready to set up your hosting and install WordPress. Have your business information, credit card, and personal information ready. The actual WordPress setup time is about 5 minutes with Bluehost, but after it is setup, there are some other tasks to complete. Think of the WordPress installation stage as the site preparation, pouring the concrete foundation and setting the footings. This will be the foundation of your business. Once you have entered a domain name, you will fill in your personal information. Next you decide which hosting package is right for you. To start out, I would recommend a normal shared hosting account. It is priced at 12, 24, and 36-month terms. The longer term you purchase, the lower the monthly rate is. For example, by choosing a 36-month hosting term, you can get the great introductory rate of $3.95 a month. As a bonus for choosing Bluehost, they provide seamless upgrades to VPS or Dedicated hosting accounts from right inside your cPanel as your needs grow! Like with most companies when you are first signing up, they do have a few other offers for you to consider. One thing that you might want is Domain Privacy so that your information about site ownership will remain private. 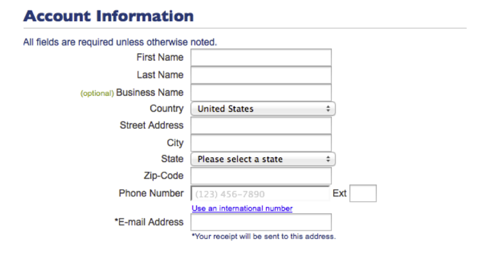 As the example shows, after you fill in all of your information and double-check to make sure it’s accurate, click “Next” to complete your purchase. Now you will be asked to create a password for your account. Next, create a strong password and keep it in a safe place. You can use the Password Generator, or create one yourself. Make sure the password has both capital and lowercase letters, a number, and a special character (? !#, etc.). Now that your account is created, we can move on to installing WordPress. Don’t be nervous, Bluehost has made this an easy step. They use the new MOJO Marketplace for installing WordPress (and other applications). Are you ready for a “One-Click” installation? In your cPanel, scroll to the section titled “MOJO Marketplace” and choose the icon One-Click Installs. You will now be on a page inside MOJO Marketplace called Scripts and Platforms. The blog section is at the very top, so all you have to do here is click on the WordPress icon. 1. 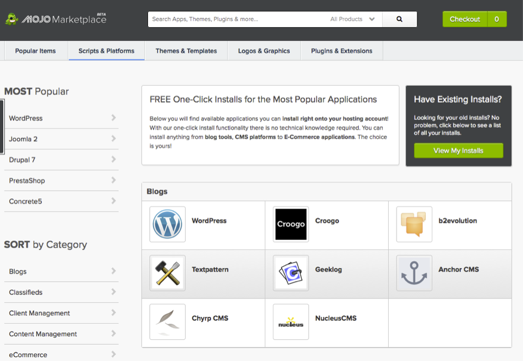 Choose where you want to install WordPress. If you purchased more than one domain, I would choose the “.com” version. You can, however, choose any domain or even a subdomain or a folder for one of your domains. You have complete control. If you already had a Bluehost account when coming here to set up your Residual Income Model, make sure to not overwrite any files for another website. Next, click on “Check Domain” to make sure the domain is assigned and pointing towards your account. 2. Go to Advanced Options. This area allows you to setup your own username and password for your WordPress installation. Make sure you use a unique username; DO NOT USE “Admin” which is a default option! Make sure that the “Automatically Create a new database for this installation” box is checked, unless you have a database that you have already setup and want to use for your Residual Income Business. You will be able to watch the installation progress on the progress page. Once the installation has completed, you will be provided with your Site URL, the admin login URL, your username, and password. KEEP ALL OF THIS INFORMATION SAFE, you will need it. The information will also be emailed to you. Bookmark and save your Admin URL. Now you can log in to your account. Enter your username and password that you selected and then click “Log In.” As you enter your new WordPress site, you will see your dashboard. This is where you control everything for your site. I remember how I felt when I set up my first WordPress site many years ago. It was exciting yet overwhelming. For now, just poke around your dashboard and see what tools and options you have. Get some rest, next we tackle Part 2 of setting up your WordPress site. Rest assured that you have made some great strides already. You have chosen a solid reputable hosting service and the best blogging platform. You have your business set up properly and you’ve created an awesome business and domain name. What a fantastic start! Never rush serious decisions when setting up your business. Do it right the first time. It’s okay to make mistakes or change your mind, just make sure that these are minor mistakes or changes. You won’t regret taking the time to do it right. If you have set up a WordPress site before or purchased domain names, share your experiences by commenting below. Have some suggestions or tips that I may have missed? I appreciate hearing from you. Hi Deborah, Great post. I actually do not have Blue Host, so it’s nice to see the simple installation of another hosting company. I have to say, I’ve had my site for a few years now and have just gotten a new domain and have to go through another small learning curve because of changes…but as you say, it’s usually pretty easy to do. Thanks so much for sharing this. It is a valuable walk through. WordPress has as much facilities we may not think. It makes blogger life beautiful. Many thanks for your awesome content on importance of WordPress platform. Thank you so much Jimmy! Can’t wait to come visit your new site! It seems you do have good knowledge of wordpress. May you solve one issue. As I removed any plugin from my wordpress blog, it shows an error that .css file is not existing. This .css file is related to the plugin what I delete. How to remove this issue.? I suggest you troubleshoot common CSS problems. Have you tried a different browser when removing plugins? Other than that, I would say it is a theme issue. You may find the support you need at this CSS Forum or try this one. There are many knowledgeable people that should be able to help you. More than likely, it will be a simple solution!